Biscotti originates from the Latin word biscotus, meaning "twice baked." I thought this was cool when I first learned that the crunchy biscuits date back to the Roman Empire, where their dry consistency facilitated long term storage for lengthy journeys and wars. I did not think this fact was so cool while I stood drooling over the oven, my hot tea in hand, waiting for the cookies to cook once, cool, and then again...and then again. But they were definitely worth the wait. Amongst tons of biscotti recipes featuring various combinations of dried fruits and nuts, this Cappuccino Chocolate Chunk Biscotti stood out. I loved the idea of adding a coffee and cocoa base to the traditional flour and sugar core, and a generous sprinkle of cinnamon and vanilla sealed the deal for me. 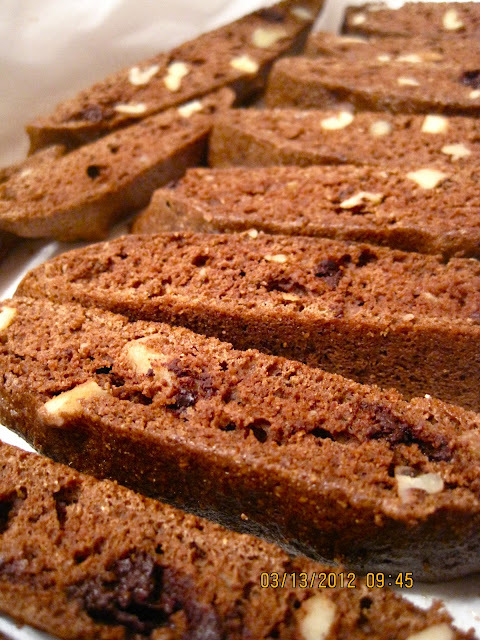 Chopped walnuts provide the signature nutty flavor to the biscotti, and I added chocolate chunks to the original recipe from Cooking Light because in my book, you can never have too much chocolate! Biscotti can be made without butter or oil and still retain its signature crunch and flavor, making it a healthier dessert option than a traditional cookie or brownie. If you are a big fan of nuts, try adding ground flax seed to the batter for a nuttiness boost and dose of fiber. I used half whole wheat flour and half regular for my batch, as well as amaretto flavored coffee to go along with the nut theme. This recipe is versatile so feel free to substitute walnuts for almonds or add dried cherries or chopped figs to your batter. *You can use regular coffee to create the cappuccino flavor too. Just pour 1 tablespoon of coffee into the coffee pot and fill water level with two tablespoons. The result will be an extremely concentrated coffee that you can add the vanilla too and pour straight into the batter; no additional water needed. 1. Combine first 8 ingredients in a large bowl (plus flaxseed if desired.) Combine coffee granules and hot water in a small bowl if using instant coffee. (Refer to note above if using regular.) Stir in vanilla and next 2 ingredients, and add to flour mixture, stirring until well-blended. Add chocolate bits and optional dried fruits and stir. 2. Turn dough out onto a lightly floured surface, and knead lightly 7 or 8 times. Shape dough into a 16-inch-long roll. Place roll on a baking sheet coated with cooking spray, and flatten roll to 1-inch thickness. minutes. Cut the roll diagonally into 30 (1/2-inch) slices, and place, cut sides down, on baking sheet. Bake for 10 minutes. Turn cookies over, and bake an additional 10 minutes (cookies will be slightly soft in center but will harden as they cool). Remove cookies from the baking sheet, and let cool completely on wire rack. These look amazing! I love the first photo too. Can't wait to try them!